Alright, the title gives the whole content of this post away, so…BYE! No. I like to hear myself talk, so I’ll keep going. Also, I know I said I wasn’t going to start posts with photography disclaimers anymore, but this is one of those posts where there are four photographs of the same thing from slightly different angles and really one photograph would have been plenty. Oh, and the lighting is gross, but I’ll get to that. I’m obsessed with putting plants in every last corner of the new apartment. They’re all over the living room and the kitchen already, and I’ve started adding some to the bedroom, too. I’ve always loved plants in bathrooms, but the bathroom in this apartment doesn’t have a window. It’s not even near a window—it’s totally devoid of natural light. I know it’s possible to cycle plants in and out of dark rooms, but considering I can barely keep a plant alive under ideal conditions, I don’t really think that’s a good option for me. 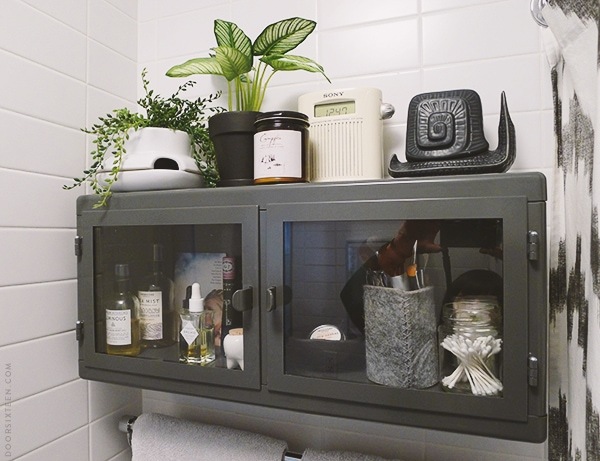 Not wanting to invest a bunch of money in turning my bathroom into a plastic jungle, I turned to IKEA’s huge line of fake plants, FEJKA (which, appropriately, means “FAKE” in Swedish). Some FEJKAs are more convincing than others. I went with this one and one of these, mostly because they were the right size and looked the least like they were actively offgassing polyethylene. OK, they really look fake this close up. Shhhhh. It helps to put these plants into pretty pots, and not just use the black textured pot they come in. I’m using a large Sagaform herb pot and one of these cute West Elm chalkboard planters. I feel like I need a little warmth in there so I might swap out the black one for this brass-esque pot (fake plant + fake brass = real glamor? 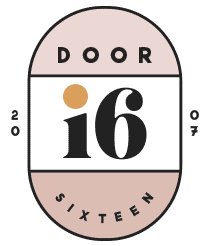 ), but for now…I’m digging it. No shame! I need to mention again how much I love this RÅSKOG wall cabinet from IKEA. I had it in the bathroom in my previous apartment, too. It’s the perfect size, perfect shade of gray, perfect everything. Plus, since it only requires two screws to properly install, I only had to drill two holes in the tile—something to consider when you’re in a rental. The bathroom in the new apartment has no storage beyond a shallow medicine cabinet, so I really had to install something. Yay, RÅSKOG! 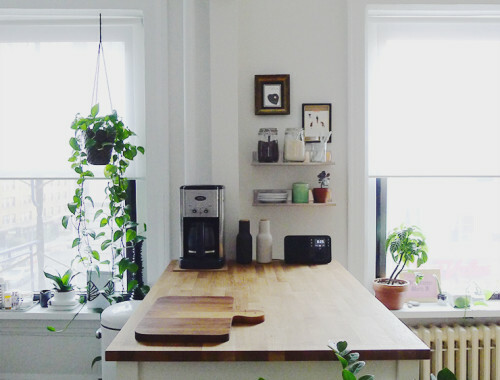 Kitchen island + coffee station. Ah! I was wondering if the bathroom in the AirB&B rental I used in Copenhagen was typical or not… and actually, now that I think about it, the bathroom in my friend’s apartment in Amsterdam was similar, just a kind of windowless box with a stand-up shower. I did exactly the same thing, only in my not light enough living room. I wanted plants in there and was sick of them dying.i selected a different IKEA fake, but can’t find it on the website to reference it. You would have to touch the leaves to know it’s fake. Excellent. That black snail is the business. I have a yellow snail bookend set but I now feel like your snail has eclipsed my snail. Fake plants – who cares. Looks good, and with no natural light who’s going to judge? Idiots that’s who. Love the colour scheme. Love the snail. 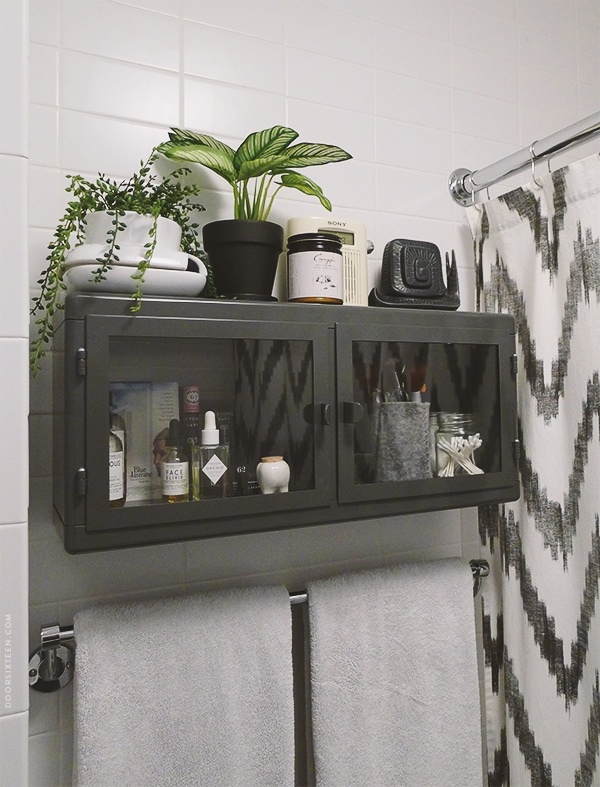 The plants look fabulous – they really look just great in bathrooms don’t they? Fabulous idea. There’s no shame in a fake plant! I never would have guessed that cabinet was IKEA! It looks great! The whole RÅSKOG line is really nice! Yippee! fake plants! I hadn’t thought of that before but they would be idea for my apartment. 🙂 I love yours and the cabinet and products in it are gorgeous. Sony shower radio! The best! I’ve had that thing for YEARS. At least a decade. It’s so great!! I wish they still made this line. Such good quality/reception. I was going to ask about the radio! We have an old boombox, sitting on the floor, but it’s the only thing that gets reception in our windowless bathroom… I was hoping to buy the radio that you have, but it sounds like I’ll have to scrounge it secondhand. Hey, no shame in that! I have them around my apartment. They don’t need maintenance and I can put a plant even in places where there’s no sunlight. Sounds good to me! These look great actually. I need to get more on the fake plant bandwagon. Not just because I don’t have much of a green thumb, but I’m also very absentminded when it comes to maintenance. I’ll plant something pretty, and then a month later remember that it’s still there – and by then, it’s brown and sad and dried up. This looks like the perfect solution. They look awesome. Fake plants are also great for people who travel a lot. Love the idea and I am going to steal it 🙂 There is no light in my bathroom at all so that is the only option. These look great AND give me a great idea for the living room display that I’m putting together. I can probably support a couple of plants in the low-lit corner I’m thinking of, but adding some fake plants will make it look nice and LUSH without me killing myself (and probably the plants). Thanks! I used to be a hater of fake plants…until I killed too many real ones. My apartment gets great light, but there are still corners that don’t get enough (and of course, those corners are where I want plants). There were different varieties to choose from (some of which were better looking than others). These ones are good enough looking to be right in front of me on my desk, in my opinion. I still prefer live plants, but I have learned to accept plastic also! Between my black thumb and my cats that eat ALL THE PLANTS, I’ve seriously been considering going FULL FAUX PLANTS but I haven’t quitee gotten the courage to do it. I’ve been eyeing some faux fiddle leaf fig plants but I haven’t been able to see them in person… that could obviously be a huge disaster (or potentially… genius?). Fake or not, they look great. 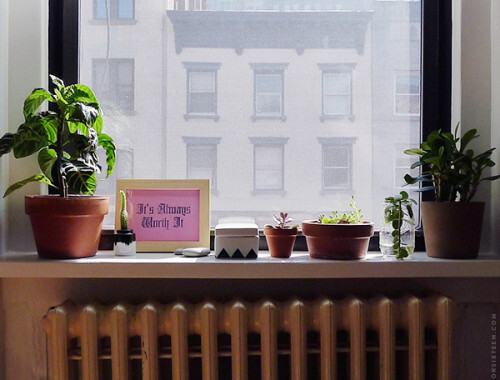 A plant always makes a room seem more homey some how. Um, that is hilarious that they named the line FEJKA! I love that cabinet too. I can’t say that apologies are required;). i bought fake succulents for my basement and i love them! and i also love your little tooth bottle! As I was reading this I was like, oh crap, I forgot to water my plants this weekend! Thanks for this! I recently moved to Saudi Arabia from Brooklyn and our apartment gets almost no sunlight. I’m sure I’ll appreciate the impenetrable UV filters on the windows when it’s 114 degrees out, but I can’t keep plants alive in this place. I’m totally going alternative. We have plastic plants around our office & love them. They’ll never wilt or embarrass us! Where is the shower curtain from? Hi Dimara, the shower curtain came from West Elm several years ago. Unfortunately it seems they no longer make it. This breaks every Feng Shui rule in the book and I love it! I can’t keep a plant alive despite my best efforts. Really bums me out actually. This looks good and I might just give it a try. Respek. I’ve had a lot of luck with variegated snake plants in rooms with no-to-low natural light. I love this idea. 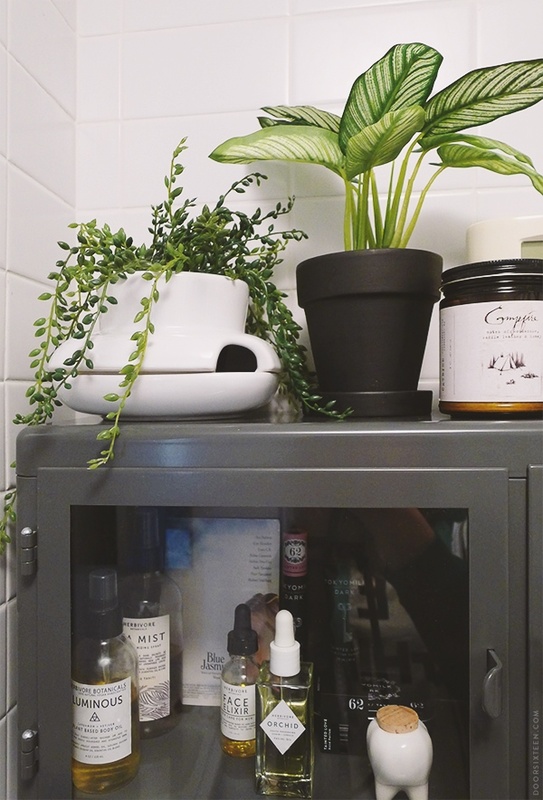 A friend told me recently that plants in the bathroom are a no-no according to feng shui but nothing else in my apartment adhere to those rules anyway. I am totally doing this. 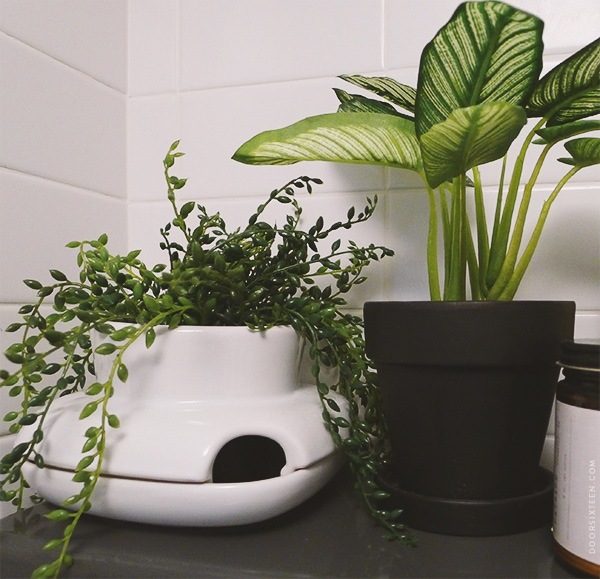 Green plant life (even fake) make me happy and brighten up any space…particularly a small bathroom. Thanks for the tip. This looks super cute! How is the size of the cabinet? Could you fit folded bath towels in it? Hi Jenna, if you follow the link to the IKEA website, the dimensions of the cabinet are listed.